While there is much to be said for making survival preparations for your own family, this is one situation where there is power in numbers, and it is probably worth your time to keep one antenna cocked as you go through life. You never know when you might stumble across a like-minded doctor, mechanic, welder, farmer, or combat veteran who would be a perfect addition to your survivalist community. Hopefully, it is immediately obvious that you won’t fair too well with a heavy-handed approach. Much of the world out there looks at preppers as being slightly out of their gourd. It doesn’t make them bad people, but it doesn’t do you any good to make it easy for them to label you a kook. Before inviting any old survivalist with a much-needed skill into your group, make sure that he/she holds similar religious/moral values. 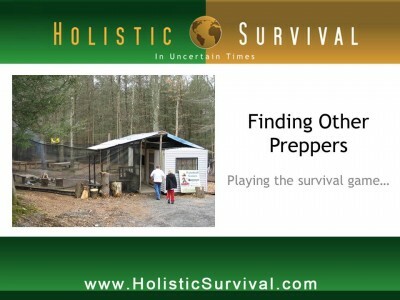 Holistic Survival founder, Jason Hartman, isn’t in the habit of suggesting someone be excluded on superficialities but the cold, hard truth is that preppers expect that, at some point, they might be living in VERY close quarters with the people in their group. It makes sense to do your due diligence to make sure you aren’t inviting an annoying person (best case scenario) or lunatic (worst case scenario) into the fold. Survival blogger, James Wesley Rawles, refers to this as operational security, or OPSEC. As a former military man, he loves acronyms. This one simply means be vigilant when recruiting others with an interest in preparedness. Thanks to the Internet, we are no longer limited to the local pickings. The following are a few websites that have long been used by preppers to find others with similar ideas. If you decide to use any or all of these websites to augment your enclave, please use common sense! You don’t know any of these people from Adam. Don’t fall in love, marry, and plan on having three kids before you even meet the guy or gal. Keep in mind that, though these types of websites tend to play towards the “looking for love” crowd, you can be on there for a different purpose, namely, creating a solid group of people willing and able to rebuild a community from scratch if it comes to that at some point in the future. Average people ready for anything.